Ooh La La! 6mm white Swarovski Crystal Faux Pearls, 4mm cultured fresh water peacock top drilled pearls and silver plated granular spacers complete this hip design. Perfect with a pair of jeans or night on the town! Each bracelet is uniquely yours. Custom sizing from 6.5 inches to 9 inches. 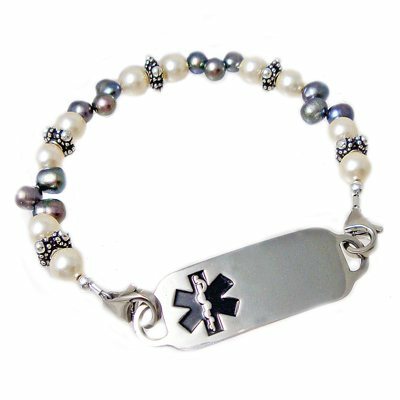 Price includes: One Deluxe stainless medical id tag with Free trational, clear, etched engraving and interchangeable beaded strand, two lobster clasps. Engraving is done in CAPITAL (uppercase letters) Please do not squish words, we cannot accomodate more letters. Thank you.